Rabindrah Tagore or Rabindranath, if you prefer calling him by his full name, remains the greatest of Indian writers and poets and the first Indian writer to acquire international celebrity. He was awarded the Nobel Prize in Literature in 1913 because of his unique anthology of fresh, sensitive and poems, entitled GItanjali, which he also translated from the original Bengali into English. The Poet W.B Yeats wrote the introduction to this masterpiece which contains 157 poems. Rabindranath’s correspondence with some of the greatest writers of the time, such as Romain Rolland, or the consideration given him by Bertrand Russell or Bernard Shaw, enabled him to publicize not only his literary work, but also his ideas of political and social reform at a time when India was entering a decisive phase in the struggle against the British rule. Tagore thus contributed to spread abroad an image of India both modern and anchored in a multi-year culture. The work of this prolific author is indeed very vast. His inspiration is mystical or patriotic, but also philosophical, amorous, exalted. Rabindranath Tagore is the author of more than a thousand poems, two thousand songs (of which he has also written music), plays, novels and short stories. He also wrote essays on all subjects that were dear to him, from philosophy to politics, education to the arts. He also left behind many sketches, drawings and paintings. 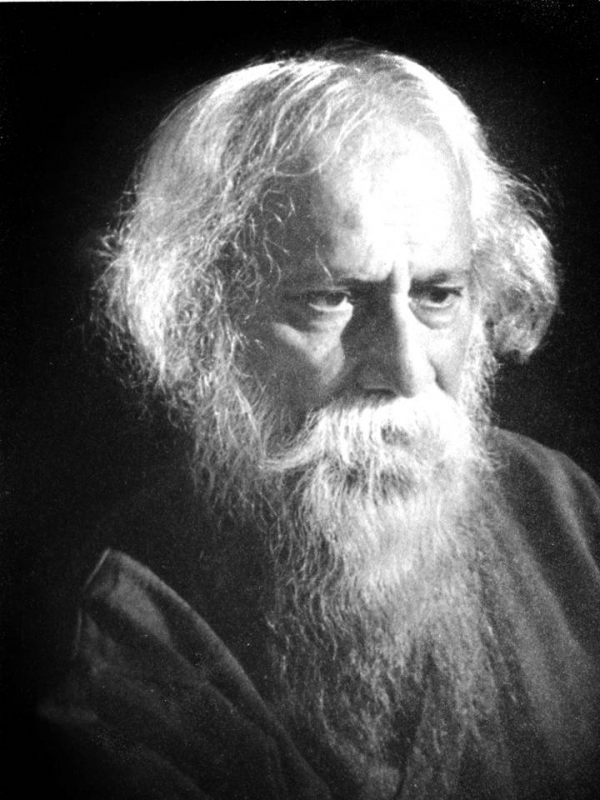 But Tagore remains above all a poet – Kobi, the Poet - as he is affectionately known in India, and it is through his poetry that he became known throughout the world. During a brief stay in Kolkata, I recently had the golden opportunity to visit Shantiniketan – the birthplace of Rabindranath – and his open-air University, Visva-Bharati. I was filled with wonder by the organization of the education system, the friendly interaction between students and teachers. Rabindranath’s system of education aimed at promoting international co-operation and creating global citizens rooted in their surroundings but connected cultures of the wider world. Tagore also believed in the fact that the curriculum should revolve organically around nature and not in closed classrooms. Therefore the open air classrooms have flexible schedules to allow for weather shifts, natural phenomena and seasonal festivals. I only hope that the life and legacy of this famed Poet, author, composer, artist and social reformer will be studied by our upcoming generations.